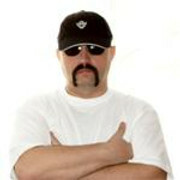 Truckstops, Kenworth and Fuller keep the 18-Wheeler Trucker on rolling !!! SI PHILLIPE ESTAS EN LO CIERTO, EL TEXTO DICE "DISEÑADAS" EN FRANCIA, SE CONSTRUYERON EN VARIOS PAISES, YA QUE ES LA MISMA DE LOS ZIL Y DE VARIOS ASIATICOS DE LA EPOCA. ¿A qué marcas asiáticas os referís? No acabo de encontrar parecido con otras cabinas que no sean Zil. Ya había visto el Hino TX porque ya lo habías posteado pero sigue sin parecerse al Roman ¿no crees? TAPANDO LA CALANDRA ES LA MISMA CABINA, VOY A BUSCAR DOCUMENTACION QUE AVALE LA OPINION, ESPERO ACORDARME DONDE LO LEI!!!! Los laterales de la tractora azul, se me dan un aire a los Iveco Pegaso Eurostar...igual aprovechan esas cabinas ya que con la substitucion de estas por el Stralis...ya en Europa ...Cero. BARREIROS DIESEL, ¡ES UN MOTOR ESPAÑOL! SR are cut-in letter from factory name: Steagul Roşu (red flag), from Braşov (Brashov) - România, which became in time: Intreprinderea de Autocamioane Braşov (Braşov trucks enterprise), Autocamioane Braşov (Braşov trucks), ROMAN SA. The first trucks produce there, use this name. The first model was produce there, from 1954 and was named SR 101 - it was a copy of the soviet truck ZiS 150 (ZiS - Zavod imeni Stalina), which was, on his turn, a copy of the american truck International KR-11. The truck has 4 tons payload, 6 in line gas engine, 5560 cmc, 95 HP, twin discs dry clutch, 5 speeds gearbox, 4x2, banjo type rear axle with twin wheels, 8 lugs, tires: 9.00-20. Wheelbase: 4000 mm; track front/rear: 1700 mm / 1740 mm. SR 101 had few derivations like: SR 104 - 4x4 (unfortunately, no photo with this model), SR 109 - dump truck. 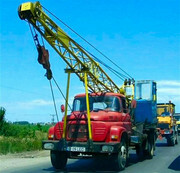 SR 101 it was replace, starting with 1960, by the SR 131 Carpaţi (in 1958 starts new models developments, inspired from the american medium-lights trucks). The new truck has 3 tons payload. The cab of this models, was designed by the french, from Chausson Plant. It use a V8 gas engine, developed in Braşov by a Ford Y engine base, 5025 cmc, 140 CP, 32 daNm, single disc dry clutch, 4 speeds gearbox, speeds 2, 3 & 4 synchromesh, 4x2, split type rear axle with twin wheels, 6 lugs, tires: 7.50-20. Wheelbase: 3400 mm, 4100 mm; track front/rear: 1650 mm / 1650 mm. 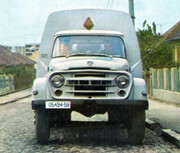 From 1962, with SR 131 Carpaţi, was banked together the new model SR 132 Carpaţi, with 2,5 tons payload. It use same V8 gas engine, developed in Braşov by a Ford Y engine base, 5025 cmc, 140 CP, 32 daNm, single disc dry clutch, 4 speeds gearbox, speeds 2, 3 & 4 synchromesh, 4x4, split type front and rear axles, rear axle with single wheels, 6 lugs, 2 speeds transfer case, without central differential, tires: 9.75-18. Wheelbase: 3400 mm; track front/rear: 1780 mm / 1750 mm. 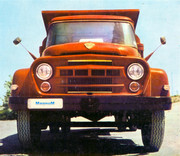 After a while, the payload was increase from 3 tons to 5 tons and start in production, from 1964, the new model SR 113 Bucegi, with 5 tons payload, based on the same cabin, designed by the french, from Chausson Plant, V8 gas engine, developed in Braşov by a Ford Y engine base, 5025 cmc, 140 CP, 32 daNm, single disc dry clutch, 5 speeds gearbox, speeds 2, 3, 4 & 5 synchromesh (on option, the gearbox can be coupled with a auxiliary gearbox - reducer, air controlled), 4x2, banjo type rear axle with twin wheels (rear axle can be fitted with 2 speeds differential, air controlled), 8 lugs, tires: 8.25-20, 9.00-20. Wheelbase: 3620 mm (prime mover, dump truck), 4000 mm, 4400 mm, 4800 mm; track front/rear: 1750 mm / 1750 mm. SR 113 Bucegi had few derivations like: SR 115 Bucegi - prime mover, SR 116 Bucegi - dump truck. 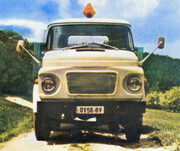 In the same year, 1964, start the production for SR 114 Bucegi model, with 4 tons payload. V8 gas engine, 5025 cmc, 140 CP, 32 daNm, single disc dry clutch, 5 speeds gearbox, speeds 2, 3, 4 & 5 synchromesh, 4x4, split type front axle, banjo type rear axle with twin wheels, rear differential with selectable locker, air controlled, 2 speeds transfer cases, without central differential, 8 lugs, tires: 9.00-20. Wheelbase: 4000 mm; track front/rear: 1780 mm / 1750 mm. 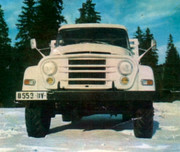 On the base of SR 113 chassis, the factory made a 6 tonns model, with chassis and rear suspension reinforced, to increase the load capacity from 5 tones to 6 tones and cab over engine, called SR 7BA1 - truck, or SR 18TBA1 - prime mover. This truck use same mechanical line, like SR 113: V8 gas engine, 5025 cmc, 140 CP, 32 daNm, single disc dry clutch, 5 speeds gearbox, speeds 2, 3, 4 & 5 synchromesh, 4x2, banjo type rear axle with twin wheels, rear axle with 2 speeds differential, air controlled, 8 lugs, tires: 8.25-20. Wheelbase: 2500 mm (prime mover), 3100 mm, 3550 mm; track front/rear: 1750 mm / 1750 mm. SR BA had a version 6x4, called SR 14BA32S (unfortunately, no photo with this model), manufactured in small number. In 1973, V8 gas engine, 5025 cmc, 140 CP - engine code SR-211, was replaced with a 6 in line diesel engine, 5491 cmc, 135 CP, SAVIEM patent (SAVIEM - Société Anonyme de Véhicules Industriels et d'Equipements Mécaniques) - engine code 797-05. With this engine, was mounted on the chassis, the AK 5-35 gearbox, with 5 speeds, non synchromesh. The factory keep for SR 114 models, the original transfer case and, on option, the G-450 transfer case, with 2 speeds and lockable central differential, air controlled. 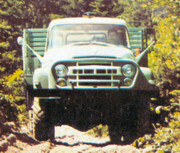 That modified versions called SR 113/114/115/116 D.
Also in 1973, the factory made a "face-lift" for the new diesel versions: they replaced the front grill, with a panel, without headlights and front bumper was replaced with a three parts bumper, adapted from ROMAN trucks, which included the headlights. The chassis and rear suspension of this models was reinforced, to increase the load capacity from 5 tones to 6 tones. This new models was renamed DAC 6135 R - 4x2 / DAC 6135 RA - 4x4. In the last years of manufacturing, the factory replaced the original hood, with a forward tilt fiberglass hood. Gradual, on the end of '80's, the manufacturing of SR trucks was stopped and replace, all the way, by heavy-medium trucks ROMAN/DAC - MAN F8 patent (MAN - Maschinenfabrik Augsburg Nürnberg). The cab for military CN models, was designed by the romanians. 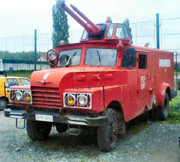 Bonus: A firetruck made in Timişoara, on a SR 114 chassis. A project, based on a ROMAN 19215 DFK chassis, with SR cab.